The Association of Churchill Fellows, founded in 1969, is an honorary society of people dedicated to the development and use of the National Churchill Museum at Westminster College. Past Fellows inductees included Churchill's grandson, Winston Churchill, Walter Cronkite; President Dwight D. Eisenhower; Sir David Cannadine, Lady Mary Soames; British Prime Minister Margaret Thatcher, Sir Martin Gilbert, International Churchill Society Chairman Laurence Geller; and the Right Honorable Earl Mountbatten of Burma. His Excellency Ron Dermer, the Israeli Ambassador to the United States Ambassador delivered the Enid and R. Crosby Kemper Lecture on the topic of “Churchill and Israel” in the Church of St. Mary the Virgin, Aldermanbury on Sunday, March 25 at 1:30 pm. Winston Churchill was an early proponent for re-establishing a Jewish state in Israel and supported the World War I Balfour Declaration, a public statement issued by the British government in support of the establishment of a “national home for the Jewish people” in Palestine. Following World War I, he was involved in reshaping the Middle East and establishing Iraq. 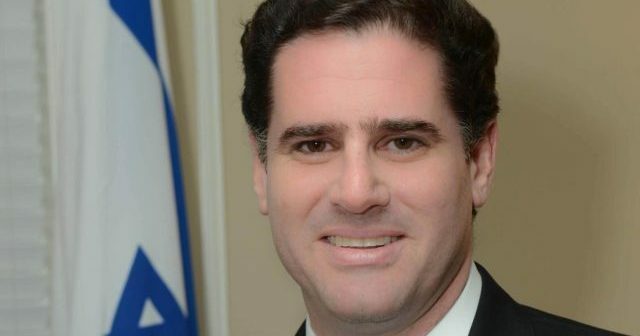 Born in Miami Beach, Florida, Ambassador Dermer moved to Israel in 1996 and began the process of becoming an Israeli citizen the following year. He worked as a political consultant for Natan Sharansky in the 1999 campaign and beginning in 2001 wrote a column entitled “The Numbers Game” for the Jerusalem Post. In 2005 he gave up his American citizenship in order to assume the economic envoy position at the Israeli embassy in Washington, D.C. Ambassador Dermer became an advisor to Prime Minister Benjamin Netanyahu, who was elected in 2009, and today he is considered Netanyahu’s closest advisor and political consultant. After four years as Netanyahu’s senior advisor (2009-2013), Dermer was made Israeli’s Ambassador to the United States. In 2004, he co-authored the bestselling book, The Case for Democracy: The Power of Freedom to Overcome Tyranny and Terror, which has been translated into ten languages. On the occasion of his lecture here, Ambassador Dermer was inducted into the Association of Churchill Fellows. For information about the 2019 Churchill Fellows Weekend, CLICK HERE.